Jhunjhunu is the district headquarters of Shekhawati in Northern Rajasthan. It is famous for its painted Havelis (merchants’ houses), stepwells and the Rani Sati Temple which commemorates the sati (self-immolation) of a merchant’s wife in 1595. So there is plenty to see during sightseeing in Jhunjhunu but Shine Gold Tours India would also like to give you the opportunity to learn some Indian cookery from the local masters. The Jamuna Resort has a recently completed cookery school, added to it’s new wing. On the first morning why not try a simple recipe – vegetable biryani – and enjoy the fruits of your labour for lunch? Fry chopped onion in oil until translucent and just turning brown, add diced tomato, fry until tender then add pinches – sized to suit your taste – of black cardamom, javitre (mace), black pepper, salt, coriander leaf, turmeric, garam masala and red chilli powder. Add boiled rice depending on the number of people to feed and finally boiled vegetables depending upon what is available but choose a variety of colors such as green beans, carrot, sweet corn etc. Mix by stirring gently or, if proficient, by flipping in the frying pan – warm through and serve immediately with raita and roti. Delicious. The cookery school runs longer courses including spice-buying and seeing some of the Rajasthani countryside and cities including a day trip to Jaipur. In addition to cookery Laxmi Kant, the owner, also organizes cycling tours of 3 to 5 days visiting the nearby villages and towns in what has been called the largest open-air art gallery in the world thanks to its painted havelis and mansions. Based on this tradition of wall painting the hotel also runs a workshop on Indian decorative art featuring pottery, textile and body decoration as well as wall painting. After lunch a tuk-tuk will meet you outside the hotel and set off for the Modi Haveli in the centre of Jhunjhunu. Entrance to the Haveli is free but the guide will show you around and he is well worth tipping as he describes the many superbly painted frescoes. Then on to the Kehtri Mahal (Wind Palace), once the splendid home of the Thakur it is now a somewhat sad ruin but can still be explored along its inner ramps eventually leading to the rooftops and splendid views over the town. 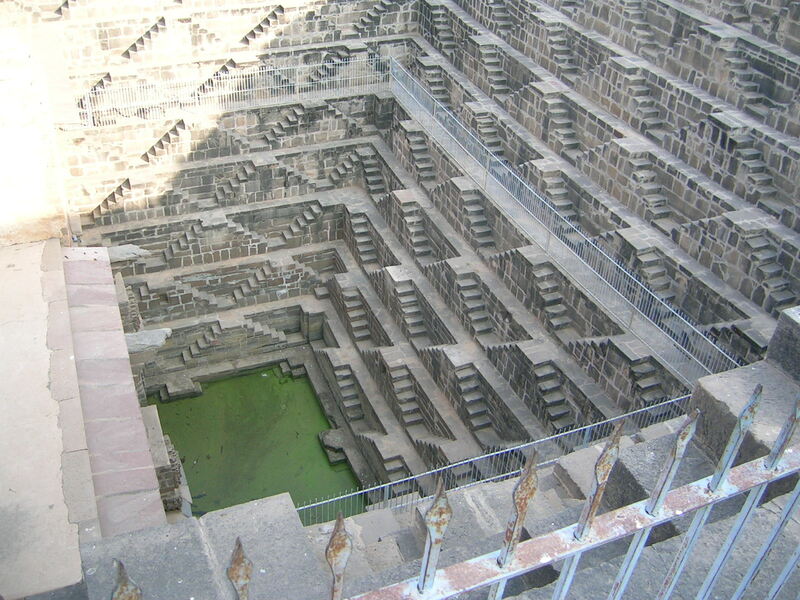 Later visit the Birdi Chand Stepwell with its 4 minarets. In an arid region such as Rajasthan fresh water is vital, so frequent visits to the communal well was a necessity which turned into a social occasion. There were often temples at the wells with richly decorated minarets and pavilions where news could be exchanged. Then on to the Rani Sati Temple which is a strange mix of devotion and Disney. A frieze inside the temple shows the Rani Sati’s story – her husband has been killed by the nawab’s army and she mounts the funeral pyre to be consumed by the flames. 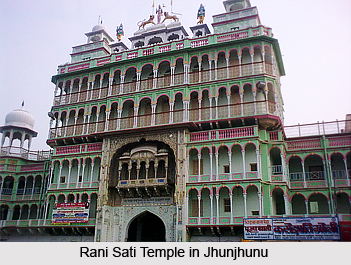 The god Durga helps her withstand the pain, her ashes are placed on a horse and wherever the horse stops her commemorative temple is to be built – hence the Rani Sati Temple here in Jhunjhunu. This entry was posted in Travel and tagged Rajasthan on May 7, 2014 by Aahna Saxena. Here are some events you can attend and enjoy while traveling to Rajasthan in the March 2014, it’s the ideal time for Rajasthan tour. March 13th to 16th – UDAIPUR, the 2nd World Living Heritage Festival comprises 4 event-filled days in the heritage-city of Udaipur celebrating its ongoing quest to preserve the living heritage of Mewar in Rajasthan, India. Built on the shores of Lake Pichola and ringed by hills, Udaipur is a truly romantic destination, famous for its iconic palaces and sanctuary-resorts. The 2nd World Living Heritage Festival is a unique opportunity to discover its living heritage – in its arts, dance and music, food and festivities. March 16th – JAIPUR. Rajasthan isn’t just all about camels and camel festivals. Jaipur, with its royal heritage, has plenty of prized elephants. On the eve of Holi each year, they’re groomed and decorated to perfection, and paraded around the city. You can also catch a game or two of elephant polo! Apparently, the sport has quite a long and distinguished history in Jaipur. For added entertainment, don’t miss the tug of war between elephants and people. March 17th – HOLI, THROUGHOUT INDIA – commonly referred to as the “Festival of Colors”. People exuberantly throw colored powder and water all over each other, have parties, and dance under water sprinklers. Bhang (a paste made from cannabis plants) is also traditionally consumed during the celebrations. On the eve of Holi people light bonfires to mark the occasion and ward of evil spirits. Holi is a very carefree festival that’s great fun to participate in if you don’t mind getting wet and dirty. March 24th – SHEETLA MATA FAIR, JAIPUR. The word ‘Sheetla’ is derived from sheetal which means calm and composed. The fair is held in Seel-Ki-Doongri village in Jaipur. It lasts for only 24 hours in which pilgrims visit to pay homage to Sheetla Mata. People from all across rural Rajasthan grace the occasion with their presence. They are uniquely dressed and accompanied with their horses and bullock carts. During this one-day fair, a small market is set up from where one can buy various shoes, clothes, foodstuff, utensils and agricultural implements. 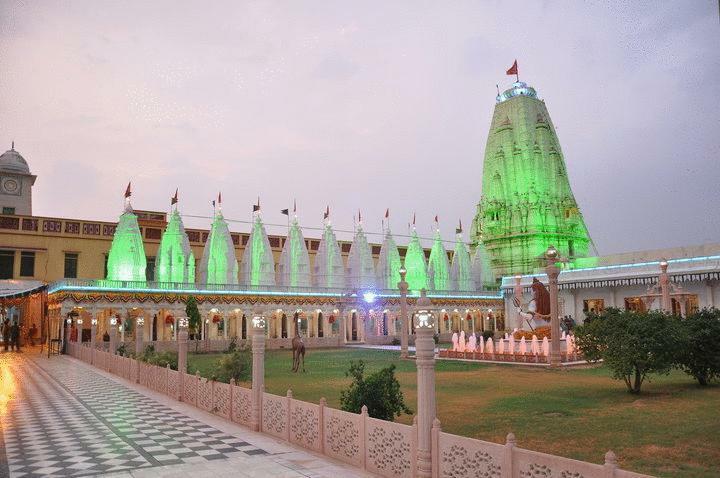 To enjoy these and other events in Rajasthan during the month of March 2014, either send a quick inquiry through the website shinegoldtoursindia.com with “Rajasthan March 2014” in the subject box and the dates when you will be in the area. This entry was posted in Travel and tagged Rajasthan on March 11, 2014 by Aahna Saxena. 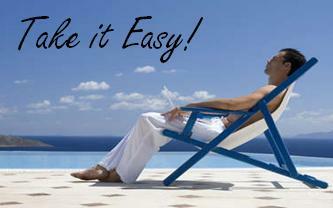 It is not easy to create a websites that look good and function flawlessly. Sometimes it can be very time consuming for web designers and developers to do everything on their own. But don’t worry there are many free tools and resources available on the internet to make a website designer’s life much easier. 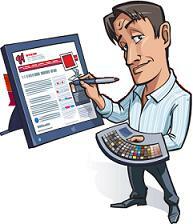 Here is list of top websites a designer should always remember during web development process. www.WhatTheFont.com – If you like the font of a website logo and you want to use the same in your website, just go to what the font and upload the logo images and it will tell the name of the font. www.colorcombos.com – Choosing a color scheme is one of the most important steps in website designing. Color combos, a website that has a huge database of different color combinations to select one for your website. www.BgPatterns.com – At BgPatterns you will be able to find a wide variety of background patterns that you can use in your website designs. spoon.net/browsers/ – It is an excellent services to test a website in different browsers. It supports different versions of Mozilla Firefox, Internet Explorer, Google chrome, Opera and Safari. www.jonasjohn.de/test-tool/ – An amazing tool to test a website for almost everything. CSS and HTML validation, SEO, images, text, Ip’s and social services. Loadimpact.com – Load impact is a free service, here you can test the impact of high amount of traffic on your website. www.converticon.com/ – Converticon is a great utility, it converts PNG, GIF and JPEG formats into high quality ICO files that can be used as favicon. www.buttongenerator.com – It is a free to use button generator services for web designers. For imageless CSS buttons use yet another services at http://www.cssbuttongenerator.com/ site. spritegen.website-performance.org – It’s a CSS sprite generator service, converts a zip file containing all the images into a sprite. CSS Sprites is a way to reduce the number of HTTP requests but it is hard to execute. www.123contactform.com – A free online contact form generator service allows you to get free html forms for your website. www.iconfinder.net – Helps you to find professional looking icons in a matter of seconds. csstidy.sourceforge.net/index.php – CSS Tidy is free online service for optimizing CSS codes by fixing errors. This entry was posted in Web Development and tagged Web Design, Website Development on October 10, 2012 by Aahna Saxena. If you are an International tourist having a wish to explore Indian cultural diversity and that too in a short span of time then Golden Triangle Tour India is an ideal circuit to visit, it generally takes 3-4 days to visit cities included in Golden Triangle India trip. The tour covers three most visited cities of north India (Delhi, Agra and Jaipur) by national and foreign tourists. The cities are around 225 kilometers away from each other, situated in different states and form a triangle when you see them in the India map. This tour will show you some grand architectural structures, ancient monuments, forts, palaces, temples, gardens and heritage hotels of Rajput, Mughal and British era. These tourist places truly represent vibrant and rich culture, art, tradition and heritage of India. 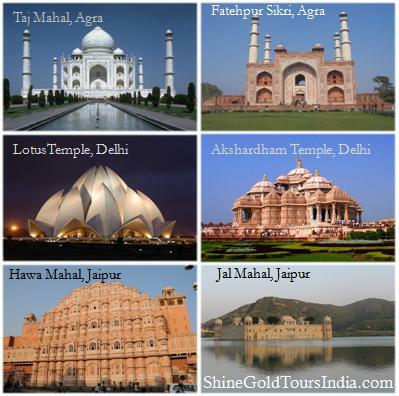 Golden Triangle India Tour generally starts from Delhi because it is the capital of India and well connected to the rest of the World as well. Delhi has several historical places to visit especially of Mughal era. Jama Masjid, Red Fort and Humayun’s Tomb are the perfect example of Mughal art. Apart from ancient monuments, Delhi also has some modern architectural wonders such as Akshardham Temple and Lotus Temple. Some other famous Delhi tourist places are India Gate, Qutub Minar, Jantar Mantar and Birla Mandir. The second destination of Golden Triangle Tour is Agra city in Uttar Pradesh state and it is perhaps the most important one as well. The city needs no introduction because it has world’s most famous monument and one of the seven wonders known as Taj Mahal, it is also a UNESCO world heritage site. Agra used to be the capital city of India during the reign of Mughal emperor Akbar and that is why the city has one of the finest structures of that time such as Agra Fort, Fatehpur Sikri, Buland Daewaza, Itmad -ud -Daulah and Chinni ka Roza. Jaipur, also known a pink city, is the third and last destination of Golden Triangle India Tour. The city is known for its unique Rajputana culture, grand forts, beautiful palaces, ancient monuments, temples, gardens and lakes. The city is also famous for its beautiful jewelry and other handmade items. Most popular places to visit in Delhi are City Palace, Amber fort, Hawa Mahal, Jaigarh Fort, Nahargarh Fort, Jantar Mantar, Birla Temple etc. This entry was posted in Travel and tagged Travel on October 5, 2012 by Aahna Saxena.